Do you enjoy juicy watermelons, local blueberries and strawberries and fresh Florida orange juice? How about carrots, broccoli, almonds and apples? If you do, please thank an insect! More than 100 crops are dependent on insect pollination, resulting in an economic value of $18 to $27 billion in the United States. Major Florida crops that benefit from bee pollination include cucumber, watermelon, specialty citrus, squash, strawberries, avocados, blueberries and eggplant. In native plant communities, pollinators aid in the reproduction cycle from flowering to fruiting, thus ensuring productivity and good health of the ecosystem. More than 70 percent of flowering plants require an insect to move pollen. Plants evolve to attract efficient pollinators, while pollinators evolve to increase foraging success. Both must adapt also to seasonal change, disease and predation. Pollinators also serve as a food source for birds, lizards and spiders. Ninety percent of birds digest insects at some stage of their lives. Not only that, bees and other pollinators help produce seeds that comprise 25 percent of bird and mammal diets worldwide. When gardeners think of pollinators, they usually visualize European bees and butterflies. However, a host of other insects are important pollinators, including native bees, wasps, moths, flies, beetles, hummingbirds and even bats. Native bees, in particular, are very important for both ecological and agricultural reasons. For instance, they are more efficient than honeybees because they work in a wider range of weather conditions and have more diverse foraging behavior and pollen-carrying techniques. That’s why researchers are focusing on habitat management and conservation to help these small but mighty winged creatures. Female bees gather pollen — a sweet, fatty, protein-rich food — to consume and to nourish offspring. They use their tongues to gather nectar for energy. During foraging, pollen sticks to bees’ bodies and is transferred to other plants along the flight path to the nest. On each foraging trip, bees visit one particular plant species and travel from 100 feet to more than a mile (larger bees can fly farther than smaller ones). They switch to different plant species as needed on future trips to take advantage of plants in their habitat. Although some bees use a single plant family for food, most are generalists that gather from a wide range of flowers. Pressures on native bee populations include loss of habitat and plant diversity due to development. Widespread use of pesticides in landscapes and on farms also have taken their toll – so much so that semi-trailers of bees are shipped across country to agricultural areas in California, Maine, Florida and the Carolinas each growing season to help pollinate crops. A special note on native thistles, which are increasingly imperiled: Please conserve these plants when possible. They are an incredibly important pollen and nectar source for a large number of beneficial insects, and they provide seeds for songbirds. Common thistles found throughout Florida are Purple thistle (Cirsium horridulum) and Nuttall’s thistle (C. nuttallii). In 2005, the The Xerces Society for Invertebrate Conservation identified the 57 bees species at greatest risk and began compiling information on the bees’ biology, distribution and habitat needs. A companion list of 59 butterflies and moths that are in peril also has been compiled. (View the “Red List” of endangered pollinators, which includes six butterflies found in Florida, at www.xerces.org/red-lists). Urban landscapes serve as connectors between fragmented natural habitat areas. That’s why even small habitat improvements in your yard can assist bees. Guidelines are similar to those used to attract butterflies: provide host plants, flowers for nectar and nesting sites, and eliminate pesticide use. Ninety percent of native bees are solitary – each female makes her own nest after mating with a male. The bees live about one year, with the active adult stage lasting 3 to 6 weeks. The rest of their lives are spent in the egg, larval and pupal stages. Seventy percent of bees nest in burrows in the ground where soil is well-drained and sparsely vegetated. The other 30 percent use soft or hollow plant twigs for nesting sites or adopt tunnels in dead or dying trees. Bumble bees, on the other hand, are social bees that live in colonies where there is one egg-laying queen and 100 to 300 independent workers that tend the nest. Nesting sites consist of things like dry holes in trees, grass clumps or even used birdhouses. Sweat bees are small, but their abundance makes them important pollinators. There are more than 200 species in the US. These bees, which carry pollen on back-leg hair patches, nest primarily in underground tunnels. Some sweat bees have drab colors, while others are bright metallic green. Leafcutting bees include more than 60 species in Florida. They are important pollinators of wildflowers and commercial crops. Their name describes the process in which leaf pieces are cut and used to form nests in rotting wood cavities and plant stems, holes in concrete walls and even snail shells. Native bees are four times more likely to be attracted to native plants, with which they evolved over thousands of years. Hybridization of many species has changed flower sizes and shapes, making them less attractive to the insects. Bees also will forage on some heirloom perennials and herbs, including basil, catnip, mint, borage, oregano, hyssop and rosemary. 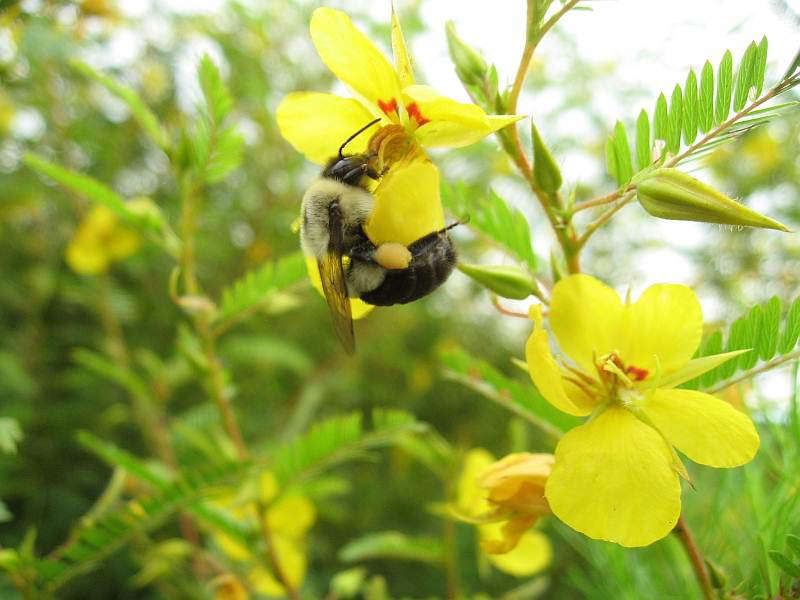 When designing habitat for bees, make sure there are at least three plant species blooming in your garden each season. Blue, purple, violet, white and yellow are preferred flower colors. Choose several colors and plant flowers in large blocks of individual species to maximize visibility. Sunny, open areas 4 feet or more in diameter are the ideal size if you have space. For maximum bee diversity, plant 15 to 25 flowering species. Bees vary in size and so do their tongue lengths, so include flowers of different shapes, too. Include flowering shrubs such as blueberries, hollies, willow, titi, swamp rose, Rhododendrons and Simpson’s stopper. Bees also utilize flowering trees, including wild plum, buttonbush, tulip tree, tupelo, sourwood, redbud, basswood and magnolia. If you have a vegetable garden, maximize pollination by planting bee-attracting wildflowers nearby, and let some of your radish, broccoli and basil grow to flowering stage. If you have well-drained soil, leave open areas for ground nesting and minimize disturbance. And don’t be overzealous on cleanups – bush piles, stumps, warm-season bunch grasses and plants with hollow stems may be used for nests. PreviousPrevious post:Florida Master Naturalist ProgramNextNext post:Sandquares — Trick or Treat? Both!